Sometimes ongoing issues, need to be looked at in a different light in order to be solved; solving buyer's concerns is no exception. In this podcast I flip the script on the traditional thinking around buyer interaction...old school sales people beware! 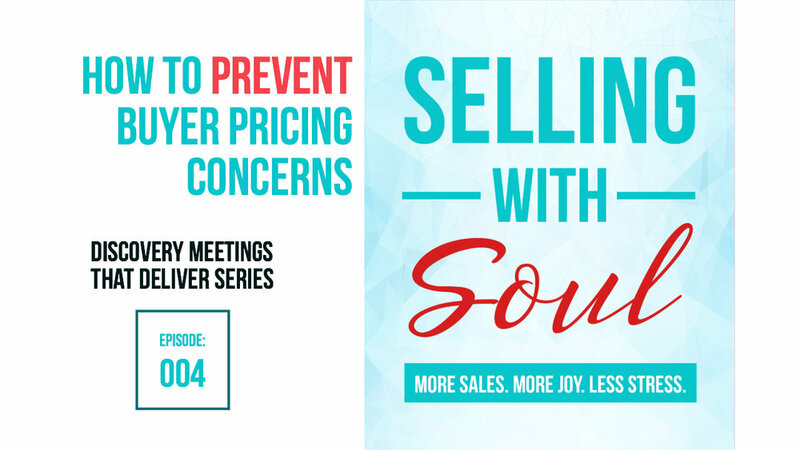 This is the fourth part in our series “Discovery Meetings That Deliver” a series dedicated to providing you with everything that you need to lead sales and discovery meetings that deliver results for you and value to your potential clients. One of the most anxiety filled conversations that my clients typically have are those about pricing. The research even proves that a female will charge $0.80 vs. $1.00 that their male counterparts do. They undervalue themselves and their product/service mostly because of fear. How do you solve this? Address it before it grows into the elephant in the room. You want your buyer to be engaged throughout the process. You spend your time upfront demonstrating the value you can bring to them by detailing out your solution to their problem. Everything is going well up until the point you bring up price. You're eventually met with reactions of "It's not in my budget", or "I don't know how I can afford this", and even "I need to run this by my partner before moving forward". Sound familiar? At this point of the process, hearing these phrases can lead to a defensive scramble where you start to push all that you have on to them, or even worse, you create an atmosphere of contention leading to the buyer feeling 'handled' by you. It's time to reevaluate the process if buyer pricing hesitations are occurring more often than not. Start by being proactive with the pricing discussion; use a pricing range as a anchor early on in the discussions. This will help eliminate a buyers distraction. Form a plan around common hesitations and address as they come up. Create an Return on Investment (ROI) analysis for your buyer that will illustrate the gain(s) from their investment. An ROI will help address some of the most common hesitations regarding affordability or budget restraints. What I have done within my business and have found great success with is using what I call a "Pre-Sale Care Package". I start off with sending a "love letter" that sets initial ground rules in order to help address any concerns before the buyer believes they are issues. An example could be that the first meeting you hold be attended by all decision makers regarding the sale. I also create a micro site that contains personal video to the buyer, along with past client testimonials to demonstrate value achieved in the past. If you enjoyed this podcast, please consider rating the podcast with 5 stars and leaving a one- or two-sentence review in iTunes. This not only helps in bringing the podcast to the attention of others but it helps me know that I am producing content that you value. It fuels me to keep going. I am also mentioning the names of all who rate the podcast with 5 stars in future episodes. I would love to talk to you in the Selling With Soul Tribe on Facebook. It’s a a sweet little community of ambitious women in business who are laser focused on growing. We laugh, we cry, we talk all things revenue. You'll fit right in! You can tell your friends on Twitter about your dedication to joining the million dollars in revenue club and our new podcast by simply clicking this link and sharing the tweet you’ll find at the other end. And like we said in kindergarten - sharing is caring kid. So if you know of someone as awesome as you who is focused on growing into their full potential. Please invite them here - we will take good care of them! Finally, thanks for listening and remember, “The world needs what you're selling”.